Sail the Crystal Clear Blue waters of Montego Bay to the snorkel location inside Jamaica's National Marine Park. The vessel will moor at Crystal Reef for your Snorkeling opportunity for approx. 30 mins. Mask and Snorkel are provided for your assistance in viewing the beautiful 'Underworld' of the coast of Jamaica. After snorkeling you will proceed to Doctors Cave Beach, located on the 'Hip Strip' and near Margueritaville for a day of fun and relaxation. You have approx. 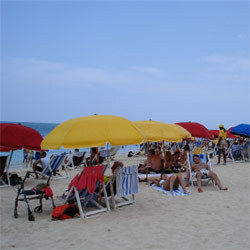 3 hours to enjoy the Beach with, 'board walk' of authentic snack shops and restaurants. Shop on the 'Hip Strip' & stop by 'Margueritaville' for a wild ride on the slide. Your return 'Sail to the Ship' will be filled with Reggae music. Feel the Reggae beat and move your feet, for the true Jamaican Experience. Cruise back to the ship is approx. 20 min.